Water lilies (Nymphaea) and lotus (Nelumbo) are jewels of the aquatic world. Symbolic in both the ancient and modern world, they are celebrated for their beauty and immortalized in art and religion. Many of them are easy to grow and reward the gardener with fragrant and sumptuous blossoms from June until October. There are two main divisions of waterlilies: hardy and tropical. Hardy water lilies will survive winters if they are planted below the freezing line in a water feature, while tropical water lilies need to be stored over the winter or treated as annuals. Tropical water lilies can have larger flowers. They have longer stalks that hold the flower higher above the surface of the water. They tend to have larger lily pads. They come in a range of colors, including blues and purples; hardy waterlilies only come in shades of yellows, reds, whites, pinks, and pastel orange. They come in day-blooming varieties (diurnal) and night-blooming varieties (nocturnal); hardy waterlilies are only day-blooming. Plant water lilies in large plastic containers or baskets specifically designed for aquatic plants. Line baskets with burlap or landscape fabric so that the soil does not fall through the cracks. Several sheets of newspaper can be placed on the bottom of containers for the same purpose. Always use topsoil that is free from herbicides and pesticides. The containers should be large enough to allow the rhizome room to spread. Since the rhizomes creep across the surface of the soil, a wider pot is preferable to a deeper one. If you don’t happen to have a pond, a whiskey barrel or planter are great alternatives. Make sure to research the ultimate size of your plant before you buy it. A waterlily with a six-foot spread will not thrive in a whiskey barrel or a small tub. There are plenty of options available on the market in all colors and sizes. If you do have a pond, why not add color to your garden with our beautiful new watering accessories by Dramm? Dramm watering tools are the choice of professional and serious gardeners for their durability and high performance. How about a purple hose to go with your pink water lilies? Planting instructions vary for tropical and hardy water lilies. Tropical water lilies should be planted just like annuals. They often come as bare root plants. Place them in the center of a container and let the crown of the plant rest just above the surface of the soil. With hardy water lilies, plant the rhizome at a 45-degree angle with the growing tip positioned toward the middle of the pot, resting slightly above the soil level. Cover the soil with gravel or a thin layer of sand. Each flower on the water lily lasts 3-5 days. They open during the day and close at night (unless they are nocturnal). Once the flower is finished, it will slowly sink into the water. Seed pods form and the ripe seeds fall into the soil below. Seed production is costly to the plant. To ensure many blooms, cut the dying flowers as they sink below the surface. Follow the stem down as far as it goes; either cut it or snap if off with your fingers. Also, clean off dead or dying leaves in the same manner. Tropical water lilies can be stored over winter by lifting the plant from the container and storing the rhizome in a plastic bag full of damp sand or a mix of damp sand and peat moss at 50-55 degrees. Lotus will be hardy if the tuberous rhizomes do not freeze. Plant the containers so that the soil line is below the freezing mark in your pool. This can be from 6-18 inches deep, depending on the size of your water feature. Lotuses, like water lilies, prefer 6 or more hours of sunlight. They die back at the end of the year. Cut them down to a few inches above the rhizome. Be patient with them in the spring as they are late to emerge. They prefer warm weather and will start to grow once the water temperature has risen above 70 degrees. 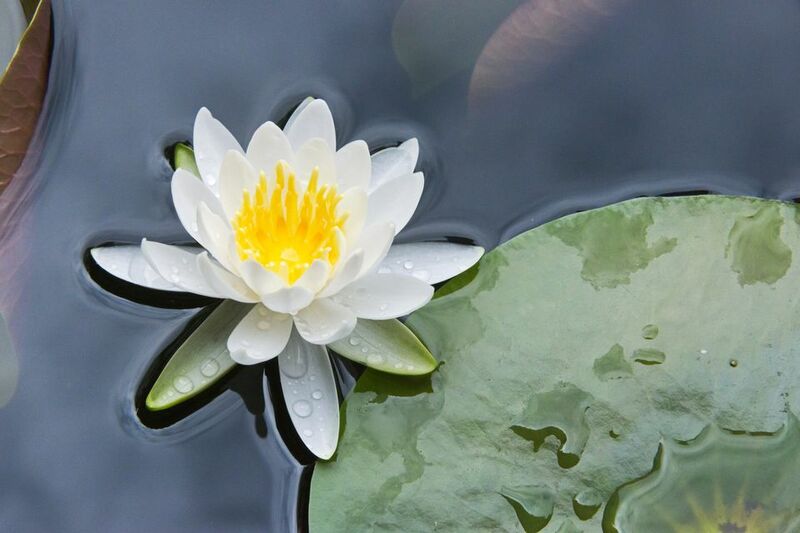 The first new leaves of the lotus float on the surface of the water, while older ones are raised in the air. They have beautiful ornamental seed heads that are used in the florist trade. Make sure your waterlily or lotus gets enough sunlight; at least 4 hours, ideally 6 hours or more. Strike a balance between plants and the surface area of the pond; plants should cover approximately 65 percent of the surface area. Remember to fertilize your plants with tablets that you press into the soil around the plant. Do not fertilize directly into the water, as you will change the pH of the water and harm both plants and fish. Fertilize plants once a month. Tropical waterlilies are heavy feeders and should be fertilized generously throughout the growing season. Pay attention to depth when you are planting your aquatic plants. Planting too high will cause hardy plants to freeze in the winter; too low will prevent young plants from receiving enough sunlight. Waterlilies prefer to be planted no less than 4 inches and no more than 18 inches below the surface. With new plantings, initially place the pot just below the surface and gradually lower as the waterlily grows. Once the plant is established, the pot can remain at the desired depth. Remember good maintenance practice: clean off old, yellowing leaves and spent flowers to keep your plants healthy.